Strictly speaking, “The Poseidon Adventure” (1972) is probably not a Great Movie, but it remains a favorite of mine. Released at a time when films played in theaters for more than just the handful of weeks than they do today, it was the longest running feature to ever open here in Mexico by far. I was lucky enough to first watch it as pre-teen, the perfect age to be fully impressed with such a spectacular movie of (then) unprecedented size, a film where fate was crueler to its more beloved characters than any other I had previously seen. 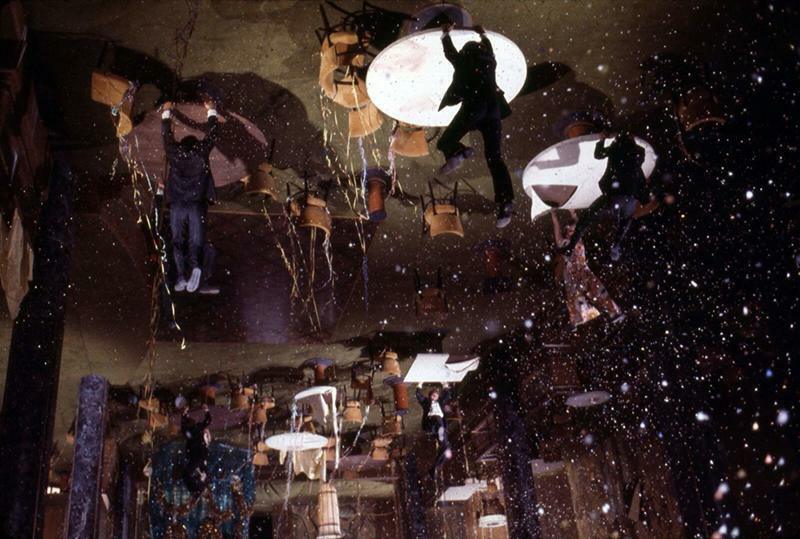 "The Poseidon Adventure" was the one cinematic experience that got me hooked on movies for life. “The Poseidon Adventure” is about the capsizing of the SS Poseidon, a cruise ship on the Mediterranean Sea that gets hit by a giant tsunami wave on New Year’s Eve, forcing the survivors to move to the bottom of the vessel. Gene Hackman’s ever combative Reverend Scott gives the movie the crucial, bonafide lead sorely missing in Wolfgang Petersen's unmemorable 2006 remake, as does the angry Mike Rogo (Ernest Borgnine), a darker version of Scott (“maybe we’re two of a kind!”). Shelley Winter’s Belle may be corny to the extreme but she plays the part so earnestly and with such determination that her death scene becomes just about the saddest moment I had ever seen on screen until “Roma” and Cleo came along. Some of the other characters aren't as well-drawn, like Red Buttons’ aging bachelor whose nature is not too different from Winters’ but is much too sanctimonious. His much younger (and I suppose) romantic counterpart Nonnie, played by Carol Linley, acts completely helpless from start to finish, and she too is more than a bit exasperating. Additionally, Linley’s dubbed rendition of “The Morning After” pales alongside Maureen McGovern’s classic version of the song. On the opposite side of her, there’s the know-it-all kid (played by Eric Shea), who seems unfazed by people dying left and right, and is a bit too brave to be believable. That being said, “The Poseidon Adventure” is full of great images: the frozen faced Leslie Nielsen (in his pre-klutz period) staring at the incoming wave with binoculars in hand; the sight of the inverted sets of large portions of the ship (my favorite showing little Eric Shea trying to figure out how to use the upside-down restroom); the frail but resolute Shelley Winters sliding-off the tilted set and having no choice but to get by a gigantic Christmas tree, a burning galley, an inverted stairwell, a flooded chimney and an underwater corridor full of dangers. There’s also the magnificent inversion of the Poseidon, done with great ingenuity, fooling the audience during the ballroom scene by tilting the camera with additional, incremental angles on each progressive take. And most of all, there are the fantastic, exploding miniatures and the use of real water that both look much better than CGI. This is particularly evident when comparing the similar scenes from the 2006 remake. Even though recent technology in the latter version was able to convey such spectacular things like the ship’s swimming pool turning around, there's also a nagging feeling in Petersen's film of fakeness when the wave strikes. Besides, the old, rusty Poseidon turned out to have much more character than its ultra-modern counterpart. So much has been made recently about whether features like “Die Hard” and “Lethal Weapon” are really Christmas movies. Under the same criteria, “The Poseidon Adventure” is the ultimate New Year’s Eve movie, though I suspect this setting was mostly an excuse to reunite the entire crew and passengers in the main ballroom, the most cinematic spot for a catastrophe of this nature to strike, with the actors, stunt doubles, chairs (some inexplicably bolted to the floor) and confetti flying all over the place, along with a couple of grand pianos. The pianos are a sight so impressive, someone decided to put one aboard the sinking 747 from “Airport 77” with the same, crushing results (now, those should have been bolted to the floor!). “The Poseidon Adventure” came out at the early stage of the '70s disaster movie era, and even though its successors have become bigger and more technically advanced, it is still the best of the group for a variety of reasons. First and foremost, it's about the only one that deals with more than just a handful of characters stuck in one of its genre’s typical formats, be it the heroic, philandering pilots and brave stewardesses sacrificing themselves for the greater good in the “Airport” movies; the romantic triangles resolved by catastrophe from “Earthquake,” “Titanic” and “Airport 77”; the couples on the brink of divorce whose relationship is saved by the calamity at hand (with the expendable third party usually getting crushed or vanished) in “2012,” “San Andreas” and “Twister”; the parents on a quest to save their offspring from certain doom in “The Day After Tomorrow” and “San Andreas”; or, more often than not, a combination of one or several of these formulas. “The Poseidon Adventure” is a film that cannot be described as a mere roller coaster ride like most of the genre’s recent examples, where the characters are chased by one catastrophe after the other nonstop. It reminds me more of Ridley Scott's 2015 film “The Martian,” with its players having to survive one unexpected setback after the other in order to reach the end of their journey. 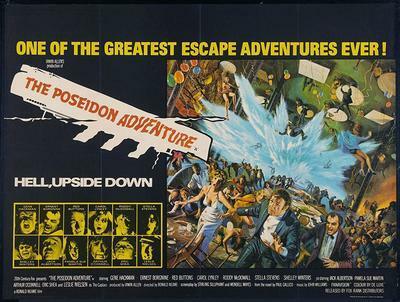 At the end of the day, what really differentiates “The Poseidon Adventure” from the other Irwin Allen productions (even the lousy ones) is the conviction behind the production. The characters in “The Poseidon Adventure” always act as if people around them are actually dying. There’s none of the absurd, passionate kissing midway through a cataclysm where scores of people are getting obliterated (think of Bill Paxton and Helen Hunt in “Twister” or Dwayne Johnson and Carla Gugino in “San Andreas”). With the obvious exception of the Eric Shea kid, every character in our movie is fair game when it comes to who lives and who dies, the unpredictability of each death creating great suspense. Allen clearly balked at taking the same risk in his following “The Towering Inferno” (1972), where both members of the Steve McQueen & Paul Newman superstar combo managed to survive. That may very well be the key to why what was billed as even-more-spectacular follow-up to “The Poseidon Adventure” was just not able to surpass it.